Just like Sherlock Holmes had a network of homeless people that helped him and Watson solve crime in Victorian England, Jay and I have the benefit of a nationwide gallery of rogues that lend aid when aid is needed in our never-ending quest for publication – the Game Artisans of Canada! Yves Tourigny (with whom I am co-designing a nifty game of superheroics with), has been able to drop off the newest prototype of Akrotiri straight into the hands of Filosophia‘s powers-that-be at a meeting where he was playtesting Midnight Men with the publishers. Thanks to Yves for doing the leg work on this one! We hope good things come from this merger between Z-man and Filosofia. Zev had Akrotiri originally, but with the joining of the companies, it got lost in the mix a bit. Once the chaos finally settled, Zev was able to show Sophie and Martin Akrotiri in its original form. We had since made some great changes to make it more interesting, speed up play, and cut out some fairly pointless rules/components from working with Quined. So we’re very happy to finally have the revised version in Filosofia’s hands. As a thank you to Yves for being the wheelman for this pick up and deliver, here’s some commissioned artwork for Midnight Men by Toronto-area artist/designer, Ron Guyatt, that we feel captures that sleek art-deco look but maintains the gritty, pulpy feel we’re going for. Enjoy the teaser and be sure to check out Ron’s Etsy shop, fearless fans, where this poster will be available for sale in a week or so! Alba Longa is the new Euro game from Tasty Minstrel Games (actually from Quined and Huch & Friends – but brought into the Americas by Tasty Minstrel). 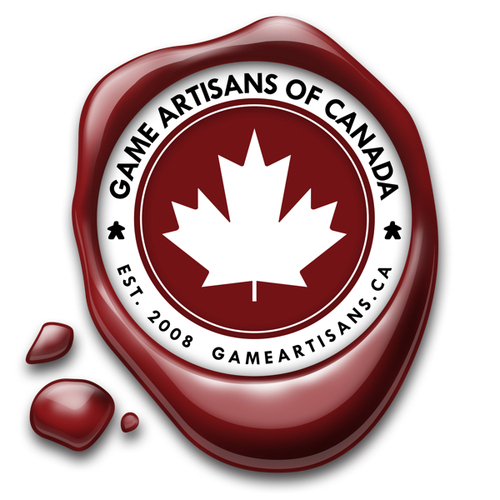 The designer, Graeme Jahns, is a member of the Game Artisans of Canada, that I also belong to, and so we thought it would be a good idea to make a video that showcases this award winning game. We decided to make a fun and informal ‘interview’ with me asking him general questions, instead of just doing a rules dump! I had the pleasure to playtest this game about a dozen times (maybe more?!) 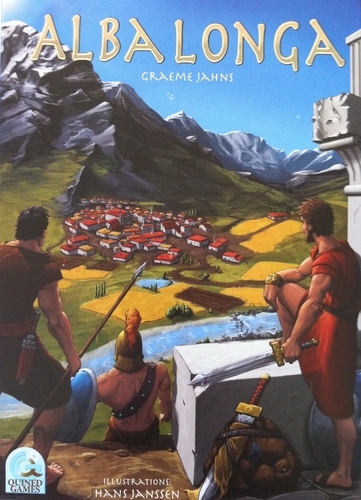 and really enjoyed it – even though it does have a little bit of direct combat in it. Check out the video to learn about Alba Longa and then head over to Tasty Minstrel’s website to pick up the game for $40 – until March 2nd! Belfort in Top 300. 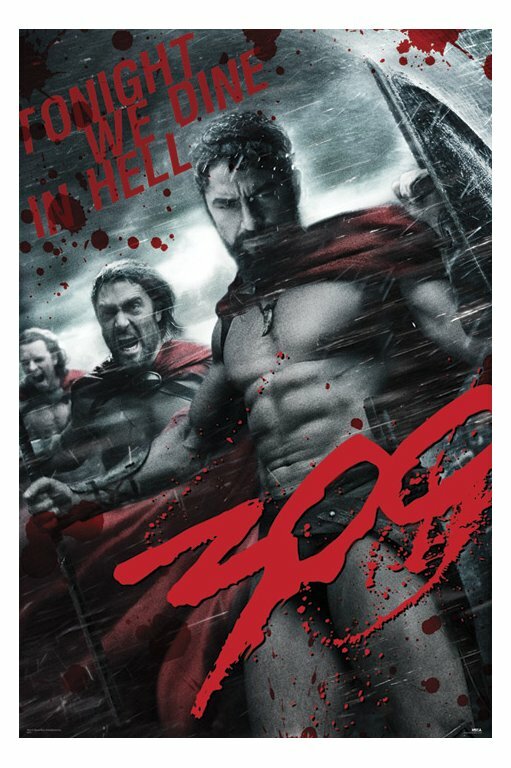 Tonight…we dine…in Hell! That’s right, Belfort is now in the top 300 games (292 as of this writing!) of all time according to boardgamegeek’s users! 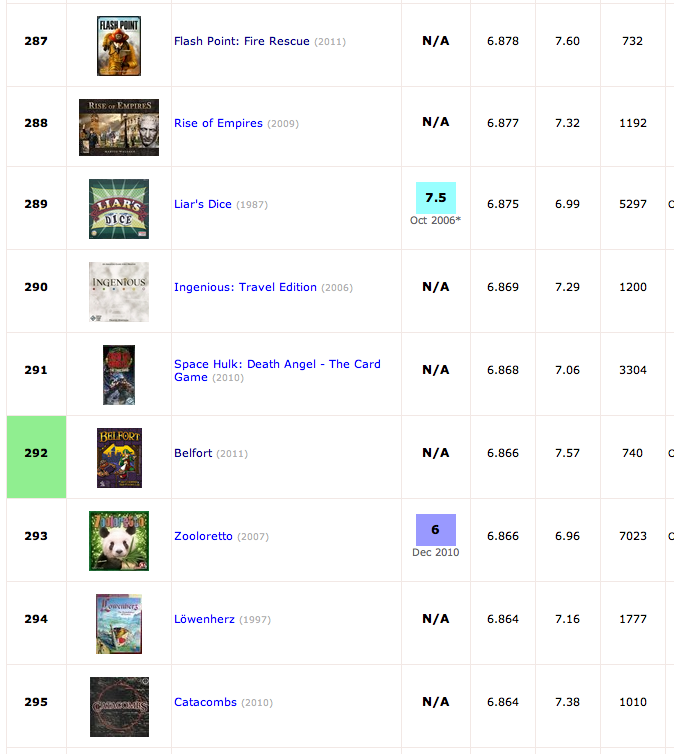 To put it in perspective there are 57,277 games in the boardgamegeek database. That puts Belfort in the top 0.5% of all the games in their database! To the uninitiated, this isn’t a chart of sales performance (I wish! ), but possibly more important for new designers, it’s a chart that averages all the users who rated the game. But it’s not even that simple. You see, a new game could come out and immediately get a few votes of 10 out of 10 from some friends and family members of the designer and publisher. This would mean it would immediately jump to the top of the list – which would make it a pretty irrelevant list. Instead, boardgamegeek has two things that help keep this list an accurate representation of the best games of all time. First of all, a game will not enter the list until it has at least 30 ratings from users (that’s my understanding – please correct me if the number is different). Then as soon as it is rated, it effectively adds 100 votes at 5.5 to that game. What this does is it pulls it’s BGG rating way down. So most new games enter the list somewhere between 2000-4000 as a new entry. Then as more and more real ratings come in from users, it starts to crawl up the list. For Belfort, on Oct 25th, 2011 (when Belfort became available to most people in stores), Belfort had 101 ratings with a TRUE average of those 101 ratings of 7.62 (it already had 101 ratings because the game had been available to a select few that attended a convention). Its BGG rating was much lower at 5.994. This meant Belfort was rated at 1577 on the list of all games. Fast forward to now and Belfort has 740 ratings and its TRUE average of those ratings is 7.57 while its BGG rating is up to 6.866 and it’s sitting at 292! All this to say, we’re ecstatic of the reaction people are having to Belfort! We’re working hard with a lot of playtesters all over the world on the expansion that is due out later this year. In addition to that, we’ve just sent to the printers a mini-promo of 3 new guilds! So lots more loving for Belfort fans coming soon. Thanks for playing! We already posted about our review in the April issue of GAMES Magazine – available in stores now – but we didn’t have a picture of what that issue of the cover looked like…and now we do! So now if you see this magazine on the shelves, pick it up and flip on over to page 75 to see Belfort first printed review!! 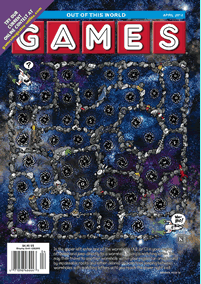 Also – for movie lovers, on page 76 is a really fun and challenging contest/puzzle. I managed to figure it out – but had to have IMDB open throughout! Sen and I got into game design because we just loved games and thought it would be fun to also create them since we both had a passion for creativity (I did theatre and Sen did DJing/singing). As might be evident to long time readers of this blog, we didn’t know what the heck we were doing at the beginning! We knew the final goal was to get a game published and of course had no idea how to get there. What we did know was the next step. The next step for a long time was to play the game again, change some rules to fix what didn’t work, then play it again. This part was pretty easy. We didn’t know how to make prototypes at all. We didn’t have fancy equipment or amazing artistic talent (anyone who’s seen our prototypes will attest to that!). We would make it out of bits of card stock and paper – sometimes spending way too much time making it (case in point: one time we actually glued backs on the tiles – AND we hand sanded the fronts so they had a bevel! This would be fine -if not excessive- for a submission of a final prototype, but this was our second version of the game! ), and sometimes scrawling on some cue cards. What’s very interesting to see and learn is that there is no right or correct way to make games. Sure we’ve learned a lot over the years from not only our experiences, but from other designers we have met – especially those that are part of the Game Artisans of Canada. I’d still say that there isn’t one right way to do anything in the game world. There are best practices and things that have worked though. This isn’t meant to disuade anyone. Quite the opposite in fact. If you are ever get that feeling like you don’t know what to do to get a board game published (or really, anything done), just do the next step. The next step will bring you that much closer to a finish line. I was happy to see this video of famed game designer Friedemann Friese as he shows off one of his prototypes. It has the same amateur-ish feel to it that our prototypes have. It is purely a design of function. It made me smile to know that while there isn’t a correct way, that other well known designers do some things very similarly! Went to the book store today as I was hoping the April edition of GAMES magazine was out. It was…it is! What’s so special about the April edition you ask? We got our first printed review of Belfort in this issue! Jay Cormier and Sen-Foong Lim make their GAMES debut with a worker placement masterpiece that even veteran designers could boast about. That’s pretty amazing to read! Thanks for playing and for the kind words John! So check out the first, and currently only printed review of Belfort out there in the April edition of GAMES magazine! Wow – 4 more positive reviews of Belfort! I’m ecstatic to see that there are still more reviews coming out for Belfort, and that more and more people are enjoying it. We played a 3-player game of Belfort and we were all able to grasp the concept and actions in the game really quickly which meant even the first time playing the game was really fun! All this sound, and is, very typical, but the game is richer and deeper than it looks, while still being fluid and fast paced. Belfort is deceptively complex looking because there are three game boards (Calendar board, Resource board and the main Game Board), but is quite intuitive to learn. There’s a lot going on here, obviously, but every aspect of it adds up to one of the best experiences I’ve had in gaming all year. Put your elves, dwarves, and gnomes to work (no trolls allowed!) and seek out this game as soon as possible. Unbelievable. Thanks so much to everyone for playing our game and for your kind words. We’re stoked that you’re enjoying it! 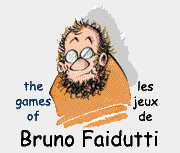 If you haven’t played a game designed by that prolific Frenchman, Bruno Faidutti…where the heck have you been? He’s the man responsible for some very popular games like Incan Gold, the beautiful Ilsa Dorada, and the classic title Citadels. He’s also 1/2 of the team behind other notable games like Mystery of the Abbey, Mission Red Planet, and Ad Astra. Chances are, you’ve played a game that Bruno designed and you may not even be aware of it! Well, we’ve played and enjoyed a bunch of his designs and co-designs. In fact, I’m particularly fond of Dragon’s Gold. And now, he’s returned the favour and played one of *our* games – Belfort. Bruno was the first one on Boardgame Geek that figured out that “Belfort” is an actual city in France. 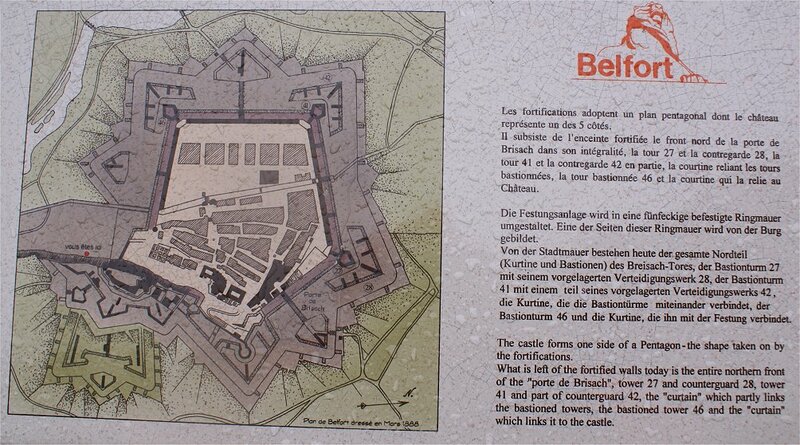 Mr. F described the real Belfort as “boring” when he heard we were naming a game after it. After reading his impression of the game, I think it’s safe to assume that Bruno enjoys our version of the city much better than the real one – there are elves or dwarves in *our* Belfort! Our map is also prettier.